Remain on Earth to live her mundane life, or become the key to the future of an entire race. Can she change the paths and alter the futures of the proud fairies of Greythorn before she’s caught in the winds of their destinies? When a fairy tale character finds their true love the story usually ends with a happily ever after, so why can’t Daystorm, who was literally tossed into the realm of fairies, follow in their lead? A happy ending seems nothing more than wishful thinking. The slightly insane King Galan relentlessly hunts for her devotion and the dream paths continue to foreshadow the death of her lover, General Fox. Daystorm is no closer to finding the key to his fate as the midsummer festival arrives, and she soon discovers she’s run out of time. Fox unwittingly takes the first step on the path towards his gruesome death at the hands of the goblins, leaving her with a difficult choice. 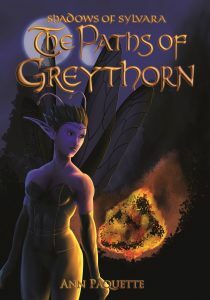 Try to change Fox’s future on her own or involve her newfound friends in a quest which will forever brand them as traitors to their beloved city of Greythorn. 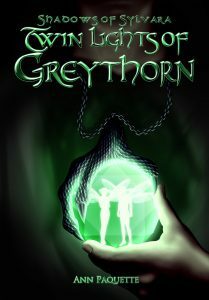 Shadows of Sylvara, book 3: Twin Lights of Greythorn – Available September 30th! Princess Ayla has long since decided her next move: search out and request the aide of the wild fairies. Catch is, the wild fairies are reclusive creatures who live deep in the jungles of Solandra beyond the explored borders of any map. She may be throwing her luck to the wind, but if they agree, the wild cousin’s magic should be enough to tip the odds in Ayla’s favor. Her mind made up, Ayla and her brother, Prince Devlyn, lead a small expedition into Solandra in search of her last hope for salvation. If the Queen refuses them the aide they desperately need, all of Ayla’s efforts in the last year will have been for nothing. After all, no amount of wild and crazy ideas will be enough to vanquish the forces at her Uncle Galan’s command. All Ayla wants is to regain her rightful place as co-heir to the throne and to break the spell forcing her and her twin to remain in twisted, misshapen bodies. Those desires, however, may be the catalyst to the downfall of all the fairies on Caliah. For the love of pit stank! 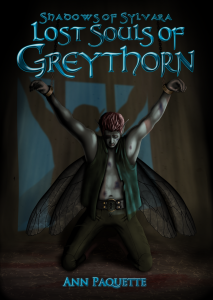 Greythorn's Nook ©2019. All Rights Reserved.